The world is your oyster at The Dundas Street Residence. Somewhere around half a mile from Princes Street, the Georgian architecture softens and the streets become leafier, independent delis and art galleries line the streets, and the fresh air wafting from The Royal Botanic Gardens begins to tingle your senses. 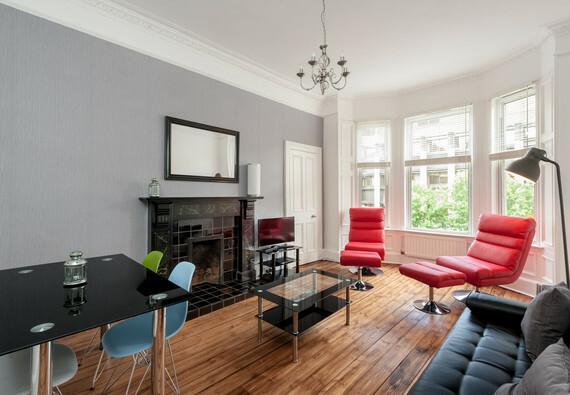 Nestled in this dreamy locale is The Dundas Street Residence, a three bedroom apartment ready and waiting to treat you to the sights, sounds and tastes of Edinburgh. Sleeping up to 8 guests, this executive property has been lovingly renovated and redecorated in July 2015, and is fully equipped with everything you need for a comfortable stay. Bask in the sunlight streaming in the large bay window in the living and dining room. Double glazing ensures that your city centre location doesn’t bring with it the normal acoustics, and you are kept nice and toasty in the winter months. After a long day’s sightseeing, you can rest your weary feet in the sizeable lounge. With leather sofa and rocking chairs, coffee table, feature fireplace and sanded floors, this stylish room is a delight for the senses. As well as the urban view below and the artwork on the walls, your entertainment needs are catered for with flat screen HD TV with Freeview, fibre broadband WiFi, and Hifi with tablet/phone cable. The owner has even left a selection of DVDs, CDs and board games for your group to enjoy. Should you tire of the countless restaurants and cafes surrounding you, the modern kitchen is on hand to assist you in whipping up your own culinary treats, perhaps using some fresh produce picked up from local Stockbridge market. All your catering requirements are met in this fully fitted kitchen, including double toaster, microwave, fridge/freezer, gas hob and electric oven, cafetiere and washing machine. Move through to the bedrooms and you are spoilt for choice. Two large bedrooms feature king size beds, hairdryers, mirrors and plentiful guest storage. A third bedroom has good sized bunk beds, perfect for kids or singles, and chest of drawers. There is a further box room with shoe rack, great for storing your luggage and any shopping you pick up along the way (after all, George St is just up the road). Also on offer are two folding beds that can be used wherever works best for you. As if a fabulous location, sleek design, and endless sleeping arrangements aren’t enough, there’s another indulgence waiting for you at The Dundas Street Residence. Venture through the master bedroom and you’ll find your very own roof terrace. Uplit from the glowing skylights next door, this inner-city slice of serenity is ready for you to enjoy a chilled glass of something naughty on a balmy evening. A very generous family bathroom completes this delightful home from home. Floor to ceiling tiles, bright windows (frosted for your privacy), and heated towel rails complete the air of luxury in this marvelous washroom. Choose from walk in shower or full size bath, and let the steamy hot water relax you in preparation for your next adventure. We know we’re ticking the right boxes so far, but this apartment’s location is the real icing on the cake. Running up through the New Town and merging in to Hanover Street to spear the heart of the city centre, Dundas Street is one well-connected thoroughfare. George Street (think shopping bags at your feet whilst you sip an amaretto sour in the sunshine) and Princes Street are just a hop, skip and a jump away, fulfilling all of your designer and high street retail therapy needs. A little stroll further, but still less than a mile from your apartment, and you’ll find yourself on the Royal Mile; the famous artery running across the medieval Old Town and home to Edinburgh Castle at one end, and Holyrood Palace at the other. A five minute wander west takes you to Stockbridge, a quaint village-like district of Edinburgh with a fantastic Sunday market, cosy old pubs and picturesque meandering Water of Leith. Follow Dundas Street north, and visit the Royal Botanic Gardens, 72 acres of peace and quiet and breathtaking scenery. For amenities, directly below is Margiotta. This residents’ favourite has been providing Edinburgh with local and organic produce for decades, and has an extensive supply of delicious and unusual little bits and bobs, as well as more regular supplies. If you prefer something a bit more familiar, there is a large Tesco on Broughton Road, just a few minutes walk east along Eyre Place. Round the corner on Brandon Terrace and Henderson Row, you’ll find numerous cafes, coffee shops and take-aways. Number 23 and 27 buses run from outside of the apartment, and will take you up to Princes Street, next to the Royal Mile and National Museum of Scotland (an absolute must! ), and Edinburgh Southside. Please note that we do not accept hen/stag groups for this property. This property is best suited to families or sensible groups. Sleeping arrangements Two bedrooms with King size beds, one bedroom with single bunk beds, two fold out single beds. Interior layout A central hallway leads to three bedrooms, one box room, one family bathroom, large living/dining room, and separate kitchen. A roof terrace is accessed via one of the bedrooms. Lovely central flat with great local amenities. Service was good although there was slight miscommunication on arrival and we were left standing for a little while. Apart from that it was good. Downside is the toilets . For a big apartment of three bedrooms and 8 people , it could have been doing with another toilet . Thank you for leaving us your feedback. We hope you had a lovely time visiting Edinburgh, and we're pleased that the apartment was up to our usual high standards. I have passed on your comments to the property manager. Very easy to book, all the information I required was there, and the service I received (before, during, and after booking) was excellent. Will definitely book again. The apartments was really excellent, every bit as good as it looks in the photos. I chose this property as I lived at the other end of Dundas Street a few years back, and know the area well. I love how close it is to the city centre, and that you can also wander around the corner to Stockbridge. The size of the property is excellent, the bed was very comfy, and the shower was fab! Hope to be back soon!